After choosing the beautiful white wedding gown you should think of ways to accessorize the attire with something meaningful, and what can be there more symbolic for the purity of a bridal image if not the choice for pearl wedding jewelry. Pearls have been always seen as the symbol of purity, of the secret of beauty that nature reveals to our eyes when the sea shell opens up to let the brilliant pearl shine through. Many pearl wedding jewelry sets are there available inside jewelry stores both online and offline. 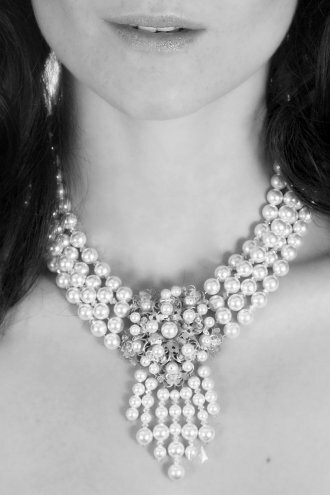 It is hard to decide merely to a single set, since all of them when displaying the presence of pearls make you want them all. These sets usually consist of a necklace and a pair of earrings to match with the necklace and the unique designs of these pieces would make it hard for you in choosing only one. If you do not have the time to go shopping inside your local stores, then the online shopping is the next one to take into account. * Look for reputable jewelry stores that sell their pieces with terms of money back guarantee if the item you have ordered for is not the one you have hoped to get. Many photos displayed online can be easily altered to show an image that is not the reflection of reality, just for the purpose to attract clients and then the site can as well vanish into the thin virtual air of internet world. * Another factor would be the presentation of your pearl wedding jewelry set with a certificate of authenticity as in this way you would know that your pearls are real and not a cheap imitation. A Common Question with Would-Be Brides:Where Can I Find Wedding Jewelry?